The end of the world has arrived – in a city at the “end of the line”. Hull is never mentioned in Flood, this extraordinary, floating drama from Slung Low, the second part in a year-long epic commissioned for Hull 2017, but the character of this port city is deep in its bones. Its poetic script creates a strange, modern fable – where the sea, a source of riches for the fishing crews, can also dredge up great dangers. The surprise haul in James Phillips’ drama is Gloriana, a woman pulled up by two fishermen from 70 metres below the waves – the depths at which no human should survive. This supernatural thread – with Nadia Emam convincingly portraying the uncertain, other-worldly Gloriana – also becomes a metaphor for the refugee crisis, as the apocalyptic storms, which we learn are sweeping across the world, bring a flood of desperate people to the shores of England. 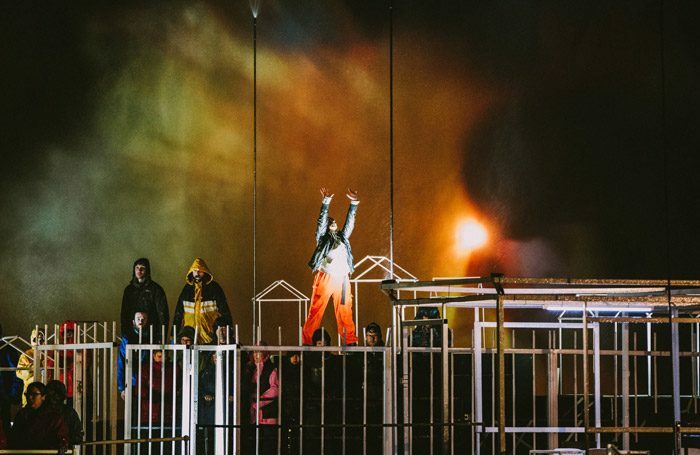 Performed at the Half Tide Basin – an enclosed former dock – Slung Low’s show impresses with its technical mastery. Taking place on a large floating stage – the actors’ words are relayed to the audience through radio headsets. Motor boats ferry cast members to and from the floating platforms, featuring a stage set of skeletal “homes”. Its greatest flourishes come in its pyrotechnics – sheets of flame and a vast fan of water, that creates a screen on which video, including viewpoints from the residents of “the city” are played. These spooky, flickering images and a storyline which follows Gloriana’s bewildered progress through a place which is intrigued – and terrified – by her presence, creates a drama about that most human of impulses: the need to support each other, and to belong somewhere.